The area around Port Royal Sound in Beaufort County is a paddler's paradise - one that offers everything from a leisurely float through a protected saltwater lagoon to challenging open-water paddles best left to the experts. Saltwater bursts over the gunnels, threatening to soak gear and firewood, as our flat-bottomed skiff labors across an agitated Port Royal Sound. A laminated map published by the S.C. Department of Natural Resources in 2001, the Port Royal Sound Adventure Guide (now out of print), doubles as a makeshift cover for the cameras. We are aiming for a tiny spit of sand called Banana Island, a part of Daws Island Heritage Preserve, where our DNR-issued camping permit says the four of us will spend the night. Just to the southeast, the larger mass of Daws' eastern half, studded with live oaks and palmettos, guards the entrance of the sound like an ancient sentry. We had planned to be paddling at this point, but a line of thunderstorms predicted for the following afternoon has convinced us to leave our kayaks on the trailer at the H.E. Trask Boat Landing on the Colleton River and opt for a power boat instead. A balky outboard engine has us second-guessing our choice. We are at the mercy of a southeasterly wind blowing across an outgoing tide and the resulting heavy chop. The only thing between us and Africa is open water. If the engine gives up the ghost, we could be washed out to sea, possibly all the way to the Gulf Stream. What was supposed to have been a relaxing paddle and camping trip has turned into a real adventure. 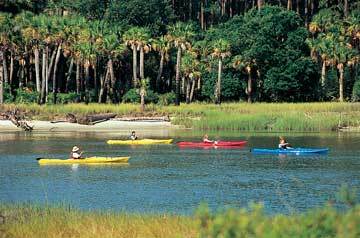 Beaufort County is a paddling paradise. From the window of an airplane, it appears to be half water and half land. 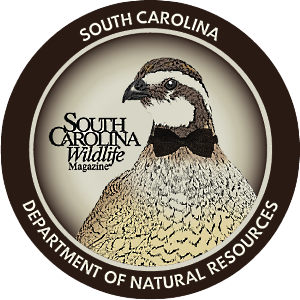 Littered with numerous barrier islands, the county is home to virtually every form of wildlife that exists along the coast of South Carolina. It would take a lifetime to explore all the creeks, rivers and salt marshes that drain into Port Royal Sound, at the center of which lies Daws Island, a small strip of land separating the mouths of the Colleton and Chechessee rivers from the wider Broad. 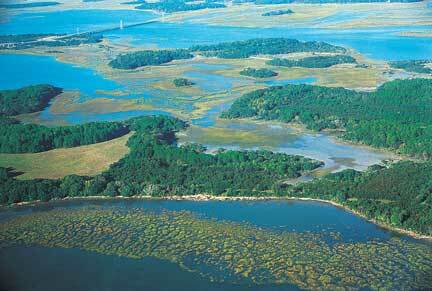 Approximately 1,800 acres of the island is saltwater marsh; the rest, upland habitat. 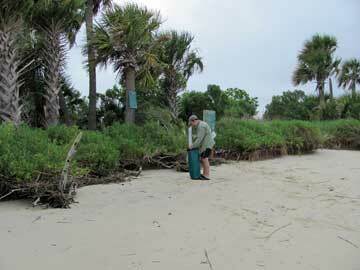 Daws Island enjoys protected status as a S.C. Heritage Preserve primarily because of its significant archaeological features; shell rings to be exact. These oyster shell mounds - some crescent shaped and others complete rings - were created by Native Americans roughly 4,500 years ago. Archaeologists don't yet fully understand the function of the rings, but locals will tell you with a smile that they are the remnants of the first Lowcountry oyster roasts. As with modern refuse, these shell mounds have had a long-lasting ecological impact. "A lot of rare plants grow in that soil," says DNR Cultural Preserve Manager Brian Long. "A lot of plants and trees that you don't normally see on the coast but that you would see in the mountains, like basswood and Carolina buckeye grow in these shell rings." Rare native privets such as Godfrey's swamp privet, leafless swallow-wort, buckthorn and tiny leaf buckthorn thrive in the alkaline-rich soil. Because of rising sea levels, many of the shell rings on Daws are surrounded by salt marsh and inaccessible to visitors. However, the island is still a great place for seeing birds, including bald eagles, American oystercatchers, white ibis, sandpipers and herons, as well as other wildlife. "It's not uncommon to come up on that island on the northern tip and see thousands and thousands of birds in the marsh," Long says. "The shell ring sites are also great rookeries because they're so isolated." 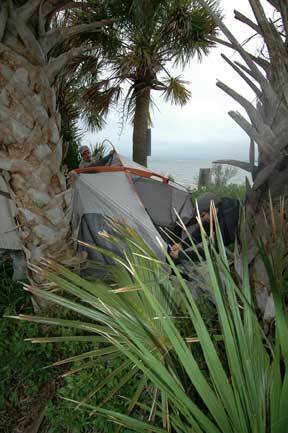 Because of the sensitive landscape on Daws Island, primitive camping is allowed only on adjacent Banana Island. The permit says up to two groups of eight people can camp at the same time, but our five-man Coleman tent occupied most of the campsite. A second tent would have been a tight squeeze. "I want to say Banana Island is less than an eighth of an acre," says Long. "During high tide, what you're really going to have to walk around on is maybe a couple of hundred square feet. It's very small. That whole marsh and island get clobbered by high tides a lot. It's kind of spooky being on that small island when the tide gets high." And as our group learned the hard way, launching at H.E. Trask Landing and traveling across the middle of the sound to Daws, even in a powerboat, can be difficult during a strong wind. "Port Royal Sound is one of the deepest natural ports on the East Coast. It's a huge area, with hundreds of sandbars and an eight-and-a-half foot tidal change," says Ben Turner, owner and operator of Bluffton-based Native Guide Tours. "You'll run into standing waves where all of a sudden there's no water under your boat. It's rough, the current's strong there and you can be swept out to the ocean." While both have traveled there by powerboat, neither Turner nor Long have ever paddled to Daws Island. "You don't want to be out there in a johnboat or a canoe for sure when the storms come up," Long warns. "If you get caught out there in Port Royal Sound, [during a storm] then you might as well be in the middle of the Atlantic." Putting in at the Edgar Glenn Landing on the Chechessee River and hugging the shore of Rose Island is a much safer approach to Daws, but even then, the trip can be extremely challenging, says Kim Gundler, co-owner and operator of Beaufort Kayak Tours. "You more often than not have a sea breeze, which means it's coming right up the mouth of the sound from the south or southeast, and that's contrary to the way the tide is running if you want to run with the tide. It can get a little ugly out there," explains Gundler. "Not to say it can't be done. If you have an experienced person with a sea kayak with a skirt and a good set of arms, they could do it. They would just have to take whatever chop came in there." High winds and tough waves may have thwarted our paddle to Daws Island this time, but we'll be back to try the big water of Port Royal Sound another day. And while paddling the open waters of the sound should only be attempted by seasoned paddlers with considerable open-water experience, many other paddling opportunities abound in the vicinity of Port Royal Sound - ranging from half-day to multi-day trips - that are appropriate for almost any skill level. Exploring the lower portion of the Colleton River is a nice half-day trip. After returning from Daws Island, we launched our kayaks from the H.E. 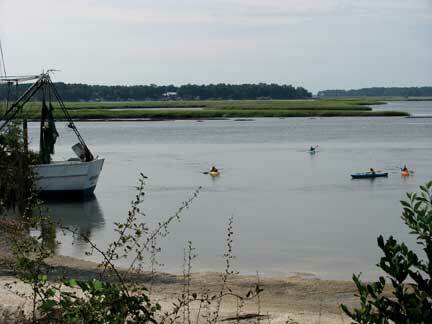 Trask Boat Landing and headed up the Colleton River past the DNR's Waddell Mariculture Center. We explored the riverbanks, saltwater marsh and feeder streams like Sawmill Creek, where we found dolphins playing and classic Lowcountry scenery like ancient live oaks draped with spanish moss, their branches extended out over the water. 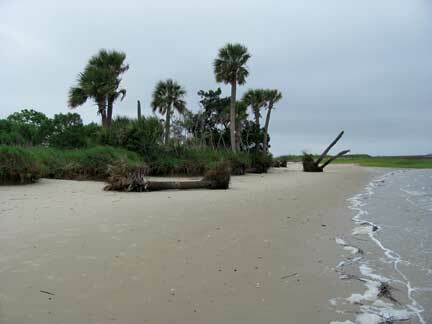 Across St. Helena Island from Port Royal Sound lies Hunting Island State Park. "I would definitely recommend the state park lagoon; I just love that paddle," says Kim Gundler. 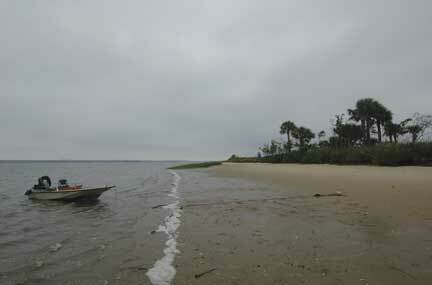 "It's a beautiful maritime forest, good wildlife, wading birds, very protected, easy navigation. You're at the beach at the halfway point, but you don't have to kayak in the ocean. There's just so many good things about that trip. I think it's a kayaker's paradise out there. The lagoon extends down to the Fripp Inlet, so it is tidal. We just ride that last hour of the high tide out, pull out on the beach down there on Hunting Island, do a little beach walk, swim or whatever and then wait for the tide to turn and ride it back in. It's really pretty." "It's just a really beautiful area," says Ben Turner, who has lived here all his life. "I go from what's called the Bluffton Oyster Factory or Wharf Street Public Boat Landing and that's the center of downtown Bluffton." Paddlers will see historic waterfront homes and structures like the Bluffton Oyster Company, which is built over shells that have accumulated from two-hundred years of shucking on the bank of the May River. Wildlife highlights of the trip include a variety of estuary birds, loons, ducks, shorebirds and plenty of dolphins. "You see all kinds of things," says Turner, "I've seen a manta ray 12 feet across come out of the water. We've got two nesting pairs of bald eagles on the May River, which have been here for years." 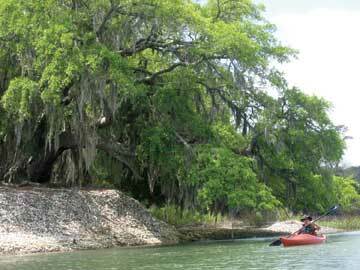 One of Gundler's favorite half-day trips is paddling Wallace Creek, across the Beaufort River from downtown Beaufort. 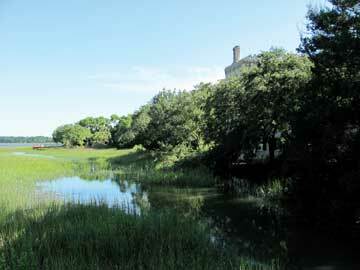 The approximately three-mile round trip begins at Wallace Landing on the last hour of high tide and ends at the Penn Center sea islands culture museum on Lady's Island. "They actually have a dock with a kayak launch out there. They've built racks so that you can paddle from the Wallace Creek Landing up to the Penn Center, and you can pull your kayak out and put it on the rack," says Gundler. "You walk into the Penn Center, go to the museum, have a picnic lunch, come back down, launch your boat and paddle back down to Wallace Creek, which is pretty cool." Visit them online at www.penncenter.com. Pinckney Island National Wildlife Refuge contains five islands and several smaller hummocks that are home to a variety of wildlife, including bald eagles, osprey, wood storks and American alligators. 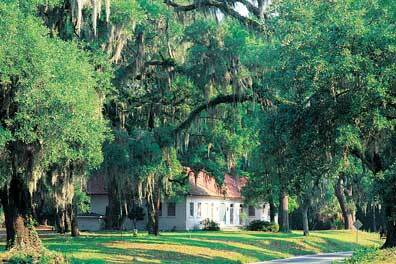 "Pinckney Island kind of separates the mainland from Hilton Head. It's just a little strip with a lot of history," Turner says. "It's just beautiful. You can see otter and mink, and if you're really lucky maybe a wild pig.With friends and clients, I put in at the Old Buckingham Landing. It's one of the oldest landings - they used it pre-Civil War." "Port Royal up to Beaufort or Beaufort down to Port Royal can be good. That's actually on our Blueways Trail," says Gundler. This full-day trip along six miles of the Beaufort River connects the historic cities of Port Royal and Beaufort. Highlights of this trip include the waterfront of Port Royal, the oldest settlement in the New World; Fort Frederick; the waterfront of Beaufort; and wildlife in the salt marsh along both banks of the Beaufort River. According to Gundler, the biggest challenge on this trip is the powerboat traffic along the Intracoastal Waterway. "It is big water and you do have to watch out for powerboats. You can stay to the side, but you still can't do anything about that wake." Ben Turner, formally with Native Guide Tours, Bluffton, S.C.
Shannon Farlow is an Asheboro, North Carolina-based freelance writer.